The Little House of Concrete Bookshelves: Marco Vichi "Death and the Olive Grove"
About half way through Death and the Olive Grove I came to the conclusion that I’d better do a bit of digging into what has been termed the Italian Civil War, given the fact that his wartime experiences weigh heavily on Inspector Bordelli’s mind and the aftermath of the War shapes much of the plot in this second Inspector Bordelli investigation. A subset of World War Two, we’re talking the period between 8 September 1943 and 2 May 1945 as the forces of Mussolini’s Italian Social Republic and the German forces in Italy fought the Italian partisans and the remnants of the Italian Royal Army who remained loyal to King Victor Emmanuel III. Mussolini had been deposed and arrested on 25 July with the King appointing Pietro Badoglio as Prime Minister and although the new regime initially continued fighting on the Axis side, they surrendered to the Allies on 8 September with King and Cabinet fleeing Rome. Lacking orders and direction, over half a million Italian soldiers were rounded up by the Nazis though most of them (allegedly as many as 95%) refused to swear allegiance to the Italian Social Republic created on 23 September after the Germans occupied most of the Italian peninsula under an operation planned and carried out by Rommel. That’s where things got really messy, with clashes between pro- and anti-Fascist forces, partisans and Germans and conflict fuelled by rivalries between the various members of the anti-Fascist front. Having been an active participant in the fighting it’s hardly surprising Bordelli would be inclined to reminisce, and the camaraderie and shared experiences would account for Bordelli ending up Piras, the son of a partisan colleague, ending up as his offsider and probably explains his affinity with petty criminals around Florence. I’m guessing they’re the sort of people who would have been disinclined to support the established authorities who would presumably have leant towards the Mussolini camp in a bid to maintain order and prevent anarchy. There was still fighting on the front lines between the Germans and the Allied forces who’d landed at Salerno on the Italian peninsula on 9 September and closer to Rome at Anzio (23 January 1944) and after they’d captured Monte Cassino at the end of a campaign that ran from January to May 1944 the Allied forces continued north, reaching the Gothic Line, something that was made possible by the US insistence on diverting troops from Italy to invade southern France rather than wrapping up the German forces in Italy, in August. That would have taken the fighting right through Bordelli’s territory on its way towards Pisa and Bologna before a stalemate through the northern winter. It’s a side of the War that has been largely ignored as historians focussed on the big picture items elsewhere (notably on both sides of Germany and in the Pacific) but the fact that the war in Europe didn’t finish until May 1945 meant the partisans (and, presumably Bordelli) had something like twenty months of extremely muddled conflict that didn’t actually finish when the War itself ended (see Tobias Jones’ The Dark Heart of Italy on this side of things). In any case, from where I’m sitting those factors mean it’s natural for Bordelli to be brooding on his wartime experiences, and you’d expect there’d be a fair degree of what we’ve come to know as Post Traumatic Stress Disorder in there as well. I’d also point out that much of this would be familiar territory to Italian readers, though that mightn’t be obvious to English, American or Australian readers of Stephen Sartarelli’s translation. Some twenty years on from the War, in April 1964 (though spring hasn’t quite sprung) a small time thief named Casimiro, who happens to be a dwarf, has been foraging for food in an olive grove where he discovered a man’s body. Casimiro reports his find to his friend Bordelli, who does his best to look after his underworld contacts, but when the pair return to the apparent scene of the crime the body has vanished. The olive grove is right beside a villa in the Florentine hills, owned by a German aristocrat who’s noticeably absent. While they’re there a large dog attacks them, is shot by Bordelli and they head off figuratively scratching their heads. Bordelli returns to the scene to find the dog has gone as well, Casimiro volunteers to keep his eye on the villa, and Bordelli turns his attention to the death of a seven year old girl found strangled with a strange bite on her belly. When a second girl is found dead a couple of days later with the same macabre signature it’s obvious we’re looking at a deranged serial killer, and as the victims continue to pile up and Casimiro stays missing, Bordelli and his partner latch onto a suspect and place him under surveillance, which turns out to be an issue when the killings continue with the suspect seemingly sitting on an ironclad alibi. Along the way they find Casimiro’s body, packed into a suitcase in his flat, and as the investigation continues there isn’t too much in the way of the forensic detecting we’ve come to expect in recent takes on the police procedural. 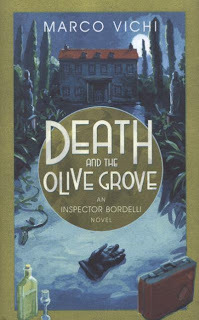 Actually, Death and the Olive Grove isn’t really a police procedural at all, more a police perambulation as Bordelli goes about his business, musing on his wartime experiences, picking up snippets of information from the numerous underworld figures that make up his circle of acquaintances and reassuring all and sundry that he’s working on the case and expects to come up with a solution soon. The solution, when it arrives, is triggered by an involvement with a beautiful (and very much younger) associate of Nazi hunter Dr Levi, a sort of colleague from wartime, when they exacted an eye for an eye revenge against Germans who were responsible for atrocities involving Italians (Bordelli) and Jews (Dr Levi). Dr Levi is still on the case, pursuing a particularly nasty war criminal but isn’t interested in delivering him to the Italian criminal justice system. If you’re looking for action packed tales involving forensic nitpicking, close attention to detail and a lively pace Bordelli probably isn’t for you, and if you’re averse to textual references to what amounts to high-powered chain smoking he’s definitely not for you, but if you’re a fan of Andrea Camilleri’s Montalbano Bordelli's cut from much the same cloth with a healthy disrespect for his superiors, an obstinate determination to do things his way and an appetite that takes him into the kitchens of the Florentine restaurants he frequents.